Looking for a new way to put your child's artwork on display beyond your refrigerator? 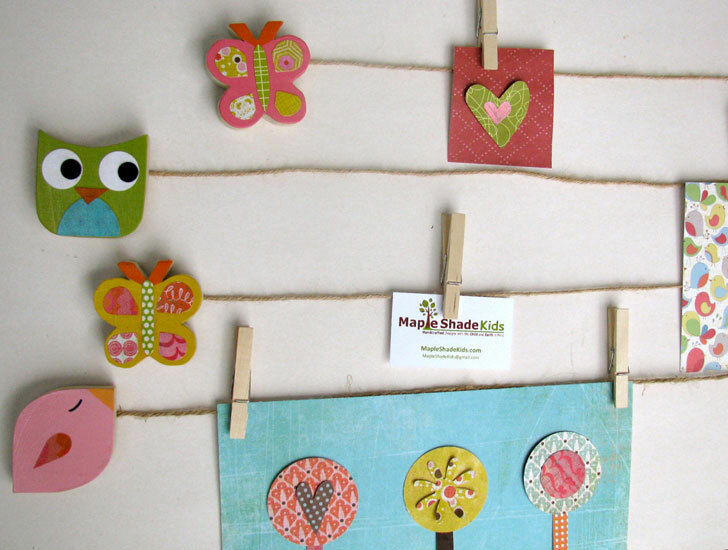 Try Maple Shade Kids Art Display Clips, which come with 5 feet of jute twine that stretches between two handcrafted wooden creatures, along with 8 clothespin holders. You can hang every painting and drawing like clothing on a clothesline and the system is easy enough for kids to swap out their latest masterpieces by themselves. Maple Shade Kids offers several variations of their art clips ranging form polka dotted mushrooms to these animated little owls. No matter the style, they are handcrafted from FSC-certified poplar wood and finished with non-toxic paint and a soy-based sealer. Details like the owl’s belly or the bird’s wing are added using patterned paper attached with non-toxic glue. While these clips are great for hanging art, the list of potential uses goes on and on. Use it in your child’s art area and they can hang paintings up to dry. Put up important school notes and awards. Incorporate it into your birthday or party theme hanging decorations from the line. Or use it more like a clothesline, hanging mittens and socks up to dry after playing outside in the snow. 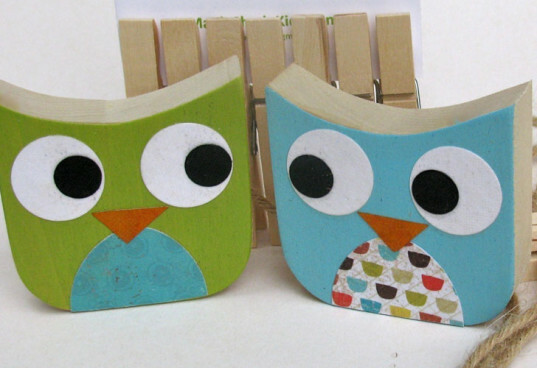 Maple Shade Kids offers several variations of their art clips ranging form polka dotted mushrooms to these animated little owls. No matter the style, they are handcrafted from FSC-certified poplar wood and finished with non-toxic paint and a soy-based sealer. Details like the owl's belly or the bird's wing are added using patterned paper attached with non-toxic glue. While these clips are great for hanging art, the list of potential uses goes on and on. Use it in your child's art area and they can hang paintings up to dry. Use it in your child's art area and they can hang paintings up to dry. Put up important school notes and awards. Incorporate it into your birthday or party theme hanging decorations from the line. Or use it more like a clothesline, hanging mittens and socks up to dry after playing outside in the snow.